my knuckles pop and my arms ache. like bones chandeliered in the wind. that’s tinged with threat of extinction. skyscrapes the blank autumn blue. who attempted to fondle their breasts. but fraught with bottomless whirlpools. as if a landslide were imminent. of Manhattan, Paris, or Milan. in your wake. That’s why I’m nervous. would dishearten you with joy. 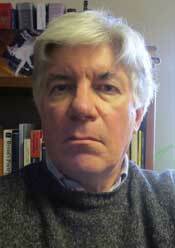 William Doreski lives in Peterborough, New Hampshire, and teaches at Keene State College. His most recent book of poetry is The Suburbs of Atlantis (2013). He has published three critical studies, including Robert Lowell’s Shifting Colors. His essays, poetry, fiction, and reviews have appeared in many journals.